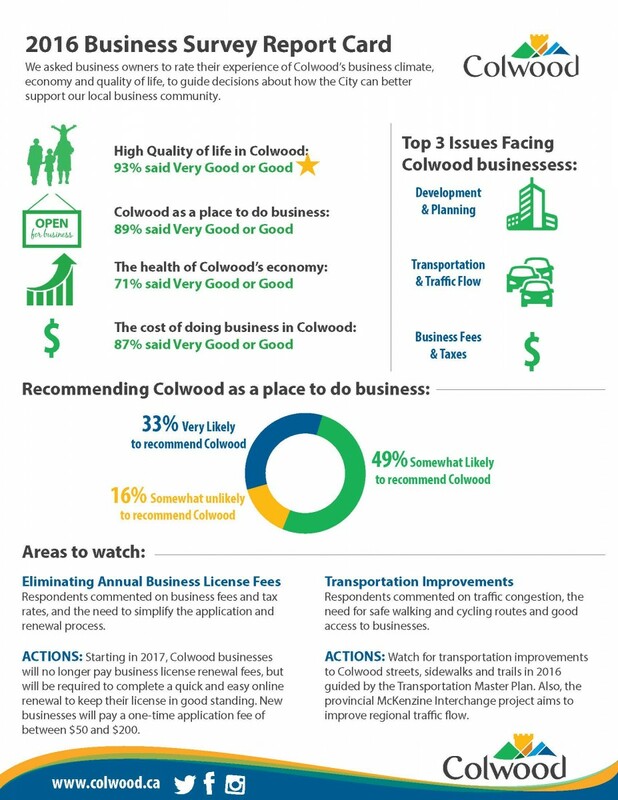 In November 2015 the Colwood Economic Development & Innovation Committee encouraged Colwood business owners to complete a brief survey to help the City better understand the perceptions, needs and expectations of local businesses. Thank you to everyone who responded. In the past, feedback from local business owners has been informal, anecdotal and difficult to quantify or effectively apply in decision making. The Economic Development & Innovation Committee recognized that in order to make effective recommendations about actions the City should take to attract and retain businesses, input and data was required from business owners. The decision was made to implement a business survey. clearly demonstrate the City’s commitment to enhancing relationships with business owners and take steps to support local businesses in our community. The survey included 9 multi-part questions asking about Colwood’s quality of life, business climate and economy as well as challenges and satisfaction with city services. It was printed and mailed out with 2016 business license permit invoices along with a letter explaining the survey and encouraging business owners to complete it, either by returning the paper copy to City Hall or using the online survey tool. 45 responses were received. The report card below provides a summary of the survey results (click the image to enlarge and view as a pdf).